Mulia Dewi Karnadi serves as Director Small Medium Corporate & One Commercial Partner Microsoft Indonesia. Through her role, she helps bridge between Microsoft and entrepreneurs in Micro, Small, and Medium-Scaled Businesses (MSMB) in Indonesia with Microsoft’s solutions that can be utilized to support their business growth. In alignment with the concept of digital transformation supported by Microsoft, Dewi also makes sure that Indonesia MSMBs get the highest level of safety and the best efficiency. As the SMS&P Director, not only does Dewi bring the mission to offer the best solutions in the MSMB segment, but she also works with enterprise customers or corporate accounts to drive growth through digital transformation in this mobile first, cloud first world. Dewi also leads strategic activities in expanding the market share for technology solutions such as Dynamics and Microsoft Business Solutions (MBS). Before joining Microsoft in March 2016, Dewi was the Country Senior Director for Systems Division at PT Oracle Indonesia. Long before developing business in Oracle, she was positioned as the Country Head of Infrastructure Solutions and Services (ISS) at PT Fujitsu Indonesia. One of her responsibilities was to lead the front line of Information Technology (IT) industry for solutions, services and products of Fujitsu. Through this said role, she was also responsible in advancing the IT solutions by expanding the market reach and improving the Go-To-Market business model. From 1997 to 2012, Dewi held the position of Managing Director for Imaging and Printing Group division at Hewlett-Packard Indonesia where she helped increase business growth summed up to two digits each year. Dewi’s knowledge on developing market industry had become one of her specialties as she was holding various executive positions in many leading multi-national corporations. She also received the MBA degree for General Business from IPMI School of Business and Bachelor of Economics degree with specialization in Accounting from Tarumanagara University. 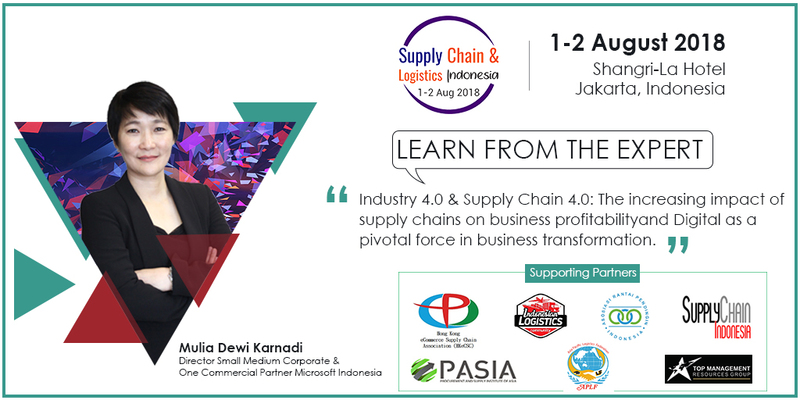 Industry 4.0 & Supply Chain 4.0: The increasing impact of supply chains on business profitability and Digital as a pivotal force in business transformation.